Are you considering replacing your siding on your Naperville home with something more updated? Siding can certainly give a fresh new look to your home and many Naperville properties have aging siding in need of repair or replacement. Our guide to siding in Naperville, IL will show you what siding products are available, what’s important when choosing a siding contractor in Naperville and what to expect during a siding installation. There are several different styles of siding available on the market today that may interest you. From traditional double four siding to shake and shingle siding, the options are there for you to completely transform the look of your home’s exterior. Double four siding has a flat profile and a very neutral appearance. This style of siding really lets the color do the talking for the overall look of your home. Double four is also the most common style of siding. Popular among many Naperville homes is dutch lap siding. This siding has a slight contour towards the top of the siding that slopes downward then falls off sharply. Dutch lap will give your home a dramatic appearance and extra dimension as it’s not perfectly flat like standard siding. Vertical siding isn’t very popular as a primary siding style for most homes nowadays, but it can work as an amazing accent siding for most homes. For example, you might want to use vertical siding on the front of eaves and gables or maybe even as a siding that meets with brick. Board and batten is a very traditional type of vertical siding described above. It contains boards and battens, that is, it has alternating wide and narrow vertical boards. This gives board and batten siding a distinct look that can look great on certain architectural elements of homes like eaves and gables and even larger sides of homes. Shake or shake and shingle siding has made a resurgence as a very popular accent siding that goes great with either double four or dutch lap styles. Shake siding looks great on the front of roof gables or architectural highlights on your home. Shake siding is basically a modern clone of outdated cedar shake siding which could rot and warp over time. The good news is that shake and shingle siding is available in durable and more energy-efficient materials like vinyl. Here’s a siding style that can really make your house stand out in the neighborhood – in a good way of course! Scalloped siding is a mosaic of half moon shapes or “scallops” and can work very well as an accent siding. Now that you’ve got your style of siding down, let’s talk about the different types of materials that you can choose to side your home with in Naperville, IL. 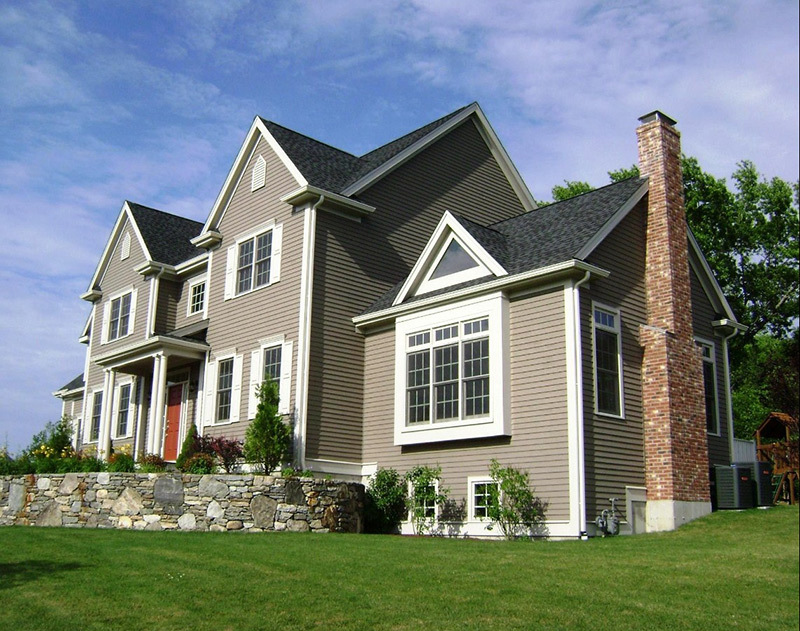 We believe vinyl siding to be the most cost-effective and energy-efficient material for siding available. Couple a high quality insulated vinyl siding with expert installation and you’ve got a significantly more energy-efficient home. Vinyl siding has several other advantages as well: you’ll never have to paint it and it is designed not to rot or warp over time. Oh, and if you have kids that like to throw baseballs, basketballs or other objects at your house, vinyl siding is extremely impact and weather resistant as well. Fiber cement siding is made of wood fibers and what is basically cement. It can have a great appearance and wears down slowly. The negative? It can be very costly and it isn’t very impact resistant. Usually reserved for industrial buildings, we wouldn’t recommend aluminum siding for looks or energy efficiency. Since it’s made of metal, it can be very resilient to rain and snow but it’s generally not a good idea to put it on a residential building like your home in Naperville. True wood siding can be very expensive and also a nightmare to maintain. Wood can rot, warp and split and that just doesn’t go well with Naperville weather. There’s no doubt that it can look good, but is it worth the expense and work involved to keep it maintained? We don’t think so. While many siding installation companies simply nail your new siding directly onto the exterior walls of your home, Feldco offers the option of insulated siding. This means that a layer of insulating polystyrene insulation is applied before your siding goes up. On installation day, your siding installers will arrive on time and setup an efficient work space on your property. This includes saws to cut your siding for an exact fit and more importantly, garbage bins to make sure that we leave your home and lawn area in as good or better shape than we found it. Individual pieces of siding are installed and then your chosen trim is applied to tidy up the corners of your home. If applicable, we also offer replacement soffit, gutters and fascia and install that along with your siding. You want experienced siding installers working on your home, not a fly-by-night crew of installers that are new to the complexities of a proper siding installation. Choose a company with over 10 years of experience installing siding. In our case, that’s over 40 years! Product quality is another major factor. You’ll be able to tell cheap siding apart from the quality home siding that you deserve. Also keep in mind the color options available. Vinyl siding, for instance, comes in many different colors and the color of your siding can make a very dramatic impact on your home’s curb appeal and the ability to sell your home later on. The fit and finish of your siding is also very important, both for looks and for energy efficiency so that you’ll be able to see the savings on your energy bills. The best siding companies working in Naperville will take special care not to damage your new siding and also to make sure all gaps and trimwork are placed carefully to allow for the natural expansion and contraction of the material over time. When it comes time for you to consider getting new siding in Naperville, we hope that you’ll get a free siding quote and experience everything that Feldco vinyl siding has to offer you. Also check out our other article if you’re interested in replacement windows in Naperville. Why Is My Vinyl Siding Wavy?